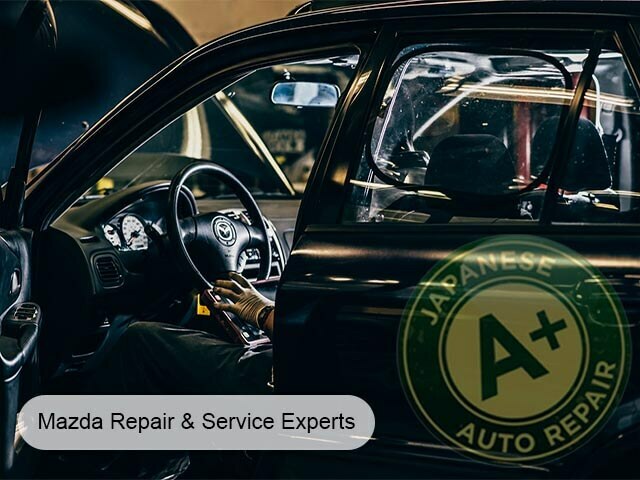 San Carlos Mazda Repair & Service - A+ Japanese Auto Repair, Inc.
Where is the best place to take my Mazda in San Carlos, CA? When looking for a facility to service your Mazda its best to look for a Mazda auto service and repair specialist. Taking your Mazda vehicle to a Mazda auto repair & service specialist allows you to access to the latest specialized technology and precise analysis from industry trained Mazda technicians. Our Mazda repair mechanics undergo regular, frequent training so they're always up-to-date on every component of your Mazda vehicle. This along with our use of high quality auto repair parts made especially for your Mazda allows us to offer a 2 year, 24,000 mile warranty on our Mazda services & repairs. In our opinion, this makes A+ Japanese Auto Repair Inc. the best place to take your Mazda vehicle in San Carlos, CA. What Mazda repair & services does A+ Japanese Auto Repair Inc. perform? By bringing your Mazda vehicle to A+ Japanese Auto Repair Inc. you will have the peace of mind knowing that your vehicle is in the hands of a Mazda repair & service expert. Our mechanics are trained on your Mazda vehicle and can perform regular maintenance and any major repairs your Mazda vehicle may need. These services range from oil changes, light bulb replacements, all the way up to timing belts, and major engine or transmission repairs. You will have the peace of mind knowing an expert service and repair mechanic is working on your vehicle. What makes A+ Japanese Auto Repair Inc. the best alternative to the Mazda Dealership? Many Mazda owners believe you have to take you vehicle to Mazda dealership for repair & service. This couldn’t be further from the truth. Finding an independent Mazda repair facility such as A+ Japanese Auto Repair Inc. is a sure way to find more value when taking your Mazda vehicle in for auto repair & service. Compared to the Mazda dealership we have different approaches to customer service which our Mazda clients appreciate and keep coming back to us for all their Mazda service and repair needs. We also have an open and transparent process to our Mazda repair & service recommendations including pictures of anything we see that we need to recommend or talk to a client about. This allows us to educate our clients on exactly what we are seeing and why it is important to the vehicles longevity, or Mazda repair & service needs. We perform regular maintenance which helps keep your warranty valid. And lastly we use the highest quality parts for all Mazda repair & service allowing us to offer a 2 year, 24,000 mile warranty on our Mazda repair & service. What Mazda models does A+ Japanese Auto Repair Inc, specialize on? A+ Japanese Auto Repair Inc. opened to the public as a full auto repair and service center in the summer of 1997. At this time we started our independent repair facility with Trained Mazda repair mechanics on staff offering clients an alternative to the dealership. A+ Japanese Auto Repair quickly became known as the place to take your Mazda for repair and service in San Carlos. Since our opening in 1997 we have been voted the #1 independent Mazda auto repair facility many times over the years. Our ASE certified auto repair mechanics are specialists at servicing and repairing all Mazda models right the first time, every time. A+ Japanese Auto Repair is a family owned and operated auto repair facility. Our Mazda service center offers clients a great customer service experience and creates trust through our open and transparent repair process. We offer many amenities and 100% customer satisfaction rating on Mazda repair and service. When it comes to peace of mind A+ Japanese Auto Repair offers 24 Month 24,000 mile Mazda repair warranty. Please visit our warranty page Mazda Warranty Page. We look forward to meeting you and helping with any Mazda repair or service needs you may have.